During "India Against Corruption" movement, many questioned the 'constitutionality' of 'fast unto death' as a form of protest. People used Dr Ambedkar's 'Grammar of Anarchy' speech as the justification. In this speech, Ambedkar says that protests of the form of 'fast unto death' were of times when there was no constitutional government, and now that India has constitutional government, people shouldn't resort to such forms of protest. Many also termed it as against the `spirit of the Constitution'. Ambedkar's arguments merely say that fast unto death isn't acceptable in democracy but don't say the reasoning behind it. Why shouldn't fast unto death be allowed, when it is nonviolent? If it is not to be allowed, why didn't the Constitution put specific restrictions on it? Merely quoting Ambedkar's speech is thus an incomplete argument against fast unto death. We should examine, why Ambedkar said what he said, to make a sense of his statement. One possible reason could be that Ambedkar's opposition for fast unto death as a form of protest arises from his deep disagreements with Gandhi's politics. Gandhi used fast unto death several times as a weapon both against British and once against the separate electorates too. Ambedkar had to relinquish his demands and compromise due to Gandhi's fast. Ambedkar's opposition to such form of protest can be seen in some of his statements, even before independence. From this, we may infer that the actual reason for Ambedkar's opposition is Gandhi and Ambedkar's experience of being on the other end of the Gandhian protest. Incompatibility with Constitution is only used as a mask when he made these remarks in Constituent Assembly. As one can see, there's a lot of subjectivity in the above interpretation and hence a larger scope of disagreement. Surely, no one knows the inner workings of Ambedkar's mind. So, we can't possibly tell. But, this can be one of the promising reasons. The other way to understand Ambedkar is not to link the dots historically as we did above, but examine Ambedkar's arguments by situating them in his broader philosophy of Constitution. Pratap Bhanu Mehta (PBM) summarises Ambedkar's approach as that of Grote's 'constitutional morality that emphasises "self-restraint, respect for plurality, deference to processes, scepticism about authoritative claims to popular sovereignty". 1. Fast unto death presumes monopoly of truth that doesn't acknowledge other's point of view. It is thus against the "respect for plurality" aspect of constitutional morality. 2. Fast unto death's "agents see themselves as personifying the good of the whole". Demands through Satyagraha posit "authoritative claims to popular sovereignty", which is against constitutional morality. We note that both the arguments of "respect for the plurality of viewpoints or shades of truth" and "no authoritative claim for popular sovereignty" embody an underlying principle of anti-absolutism - there's no one truth and there's no one place for sovereignty. There are four problems with this argument. 1. Disregard for genuine cases: The concepts of "no single truth" and "no single centre for popular sovereignty" may seem true in many cases but by saying that everything is a shade of grey in all circumstances delegitimises genuine claims in some cases. 2. Favours those who can create shades of grey: The condition of "respect for the plurality of truth" favours those who can turn even an evident truth into a facade of shades of grey. The mighty state with its influence over the media can easily create narratives to delegitimise protestors' problems and demands. 3. Favours the beneficiaries of the status quo: In a context, where inaction and persistence of status-quo is a victory of the state and a defeat for the common citizen, any narrative that creates hurdles for protestors helps the sustenance of status quo, for which the state is the beneficiary. All that the mighty state has to do is to delegitimize the citizens' demands and authority by creating an appearance of plurality, even when there isn't one. 4. If there should be scepticism towards authoritative claims to popular sovereignty, why should it be only towards protestors, why shouldn't it be towards the government too? It is not the people that are holding the government to ransom, it is the governments that hold people to ransom on daily basis, in the name of sovereignty. When people protest against the brutality of such authoritative sovereignty of governments, the blame is instead placed on the people, terming their protests an illegitimate assertion of sovereignty. If this is not an act of distorting the truth, creating shades of grey, what is! The discourse against fast unto death during the Janlokpal movement is a classic example that demonstrates the above phenomenon. The issue here wasn't that government and political parties denied the need for Lokpal. Many committees in the past have recommended it. Governments also instituted an institution on its name, but the issue was its independence and working. Governments have deliberately created weak institutions to protect themselves. When the protest emerged, what did they do? First, they created a discourse questioning the necessity of the institution, even when they had already created an institution (though a weak one). If there was no need, why did it create an institution? Second, they questioned claims of protestors over sovereignty, which as you can see is an unsettled debate, which in the end favours the status quo and thus the government. Just think of this - the same political parties which regularly organise bandhs obstructing people, create destruction of property, had suddenly new found love for the constitutionality of the form of protests? It is clearly an argument made just to delegitimize the demanding groups. If you are still unconvinced that governments’ arguments were due to genuine concern towards principles of constitutional morality as they proclaimed, and not to do with the differences over the Lokpal, note what happened to Lokpal after the protests subsided. There's no progress. In summary, Ambedkar's argument of incompatibility of satyagraha in constitutional governments isn't a reliable one as it isn't applicable to all cases and disproportionately favours the beneficiaries of status quo and those with the power to distort the truth, which is the state in most cases. Therefore, there's no reason to not allow fast-unto-death, as a form of protest. In a context, where the apathy of the state towards citizens' concerns is a norm, citizens have very few avenues to make governments listen to them and hold it accountable in-between elections. It's not the case that governments are stalled every day due to fast unto deaths. These instances are rare because governments don't pay attention unless the fast unto death gathers large support, which is not a common occurrence. By denying even this opportunity to the aggrieved and oppressed citizens based on abstract arguments not rooted in reality, we are crippling even the genuine protests like that of Narmada protestors who didn't receive rehabilitation, group of girls who are fasting for a school building and so on. It is easy to target common citizens and hold them to higher standards of accountability and morality. It would be good if the energy spent on delegitimising the protests of the helpless citizens is instead spent towards holding the governments and political parties accountable. Gulzar Natarajan argues that development is mainly a faith based activity and that the kind of evidence generated in academia these days, only makes a marginal difference. His point is that many questions that researchers study are all obvious to the policy makers. They are not able to implement them because of the structural impediments. Gulzar has a point but I heard the opposite too a lot from researchers, that policy makers are often not updated with latest developments in academic research because of their excessive focus on day-to-day activities etc. I personally have also encountered top bureaucrats in education department completely unaware of some of the influential studies in education. So, both are to at blame. One can explain this better with the cricket analogy. Policy makers are like a "poor batsman" in the field, facing Shoaib Akhtar and Brett Lee, with a broken helmet, torn gloves, and under-fed. From their vantage point, it seems that they know all the "technique" (right things to do) but they are constrained by the aforementioned factors. All that they think they need is to be provided with these better conditions, and they will execute all the right techniques. Researchers are like commentators sitting outside, partly oblivious to the batsman's condition. Their main job is to comment on the 'technique". From their vantage point, it looks like the batsman lacks technique, from the way they react to the balls. Additionally, things move very slow in real life. So, it's like watching this batsman in slow motion, facing Yorkers. When watched in slow motion, even minute deviations that might not matter in the larger picture, seem pretty big (and become worth writing papers on). The truth may be somewhere in between. The batsman may choose to believe that he knows all technique but the focus on getting around impediments like torn gloves etc. may have taken his mind off the technique, and hence might not have studied them in depth or be updated with latest developments. Similarly, no matter how hard they try, it's difficult for commentators to completely appreciate the share of torn glove's factor in the lack of display of technique. Interaction will help both - commentators will appreciate the real world factors, and policy makers will realize that they actually don't know as much technique as they think do. Their excessive focus on the day-to-day picture may have constrained their ability to look at the big picture and reflect. Even the best batsman in the world will gain from an external analyst, who dissects his moves closely, finds faults in patterns and suggests recommendations. The reason, why, as Atul Gawande says, even Olympic players have coaches. Needless to say, this is useful only if the batsman is in a position to implement, which many aren't due to the impediments like torn gloves and so on. The NEET has raised a debate over the admission criteria of higher education colleges in Tamil Nadu. Generally, the college admission is based on performance in an entrance test, with women and caste based quotas, as an affirmative action measure. Tamil Nadu did away with the entrance test in 2007. Since then, admissions to these colleges are based on performance on +2 marks. The cited rationale is that entrance tests disadvantage rural students. People are citing three different arguments to base admissions on +2 marks and not NEET. 1. NEET, an entrance exam puts rural students at a disadvantage because they often don't have the resources to take coaching. 2. The "merit" based approach (NEET) is flawed because merit is a function of family background and not necessarily an individual's efforts. Hence, we should have an equitable entrance exam, for which everyone has access. The +2 board exams fit this criterion and NEET doesn't. This is an extension of the first argument. 3. TN's approach to higher education is to provide higher education exposure to the maximum number of students possible, what is called the "upper funnel approach". Hence, the pass percentage is high as compared to other states. NEET does away with this. Though the above concerns are genuine, they still don't make a strong case for using +2 exams as the criterion instead of an entrance examination. The problems with the above arguments are as follows. Broadly there are two issues - the design of +2 exams, and the best way to correct "birth privileges". 1. Eligibility vs. Ordering: Eligibility is getting minimum marks while admission to different colleges is based on ordering (rank) and not on minimum marks. The "upper funnel approach" (TN's strategy to provide exposure to higher education) confuses between eligibility and ordering. If providing higher exposure is the concern, TN can have "passing +2 exams" as the criteria, while allocating seats based on NEET. This won't harm the purpose of providing exposure to higher education. Thus, this can't be a reason to reject NEET. 2. Eligibility exam vs. Selection exam: A lot of this confusion is because of the lack of appreciation of the concepts of "qualification exams" vs. "selection exams". In the theory of test design, there are two types of exams - qualification exams and selection exams. These exams are differentiated based on their capability to "differentiate the candidates". For instance, if I ask a room full of graduates "What is 1+1?". Everyone will answer "2". So, I can't make a reasonable judgment about the ability of the candidates based on this question. This question (1+1) thus can't differentiate between people. It can, however, be an eligibility. If a person can't even answer 1+1, then one can reject that candidate. But, one can select because someone answered 1+1. Thus, problems arise when we use "qualification exams" to "select" students. Qualification exams are supposed to test minimum criteria, they don't have "differentiation capability". They can't be used to make a reasonable estimation of the capability of the candidates. This is exactly the case with +2 exams and NEET. +2 exams are qualification exams. Often, the questions in these exams are rote based, are repeated across years, and are prone to mark inflation. One of my friends points out that there are around 1000 seats in Anna University and around 600+ students get "100%" marks in +2 exams. It is a clear reflection of the differentiation capability of +2 exams. This is the equivalent of 1+1 question above. Entrance exams also have instances of people scoring same marks, but they are at later ranks, not in the top range. Just to clarify, it doesn't mean that people getting 100% marks don't have capability. It just means that when a large number of people get those marks, you can't differentiate between people. As in the above example of 1+1, everyone can answer it, including Einstein and others. Answering the question doesn't mean that Einstein doesn't have the capability. It just means that Einsteins can't be differentiated by questioning 1+1. If it's used, we treat all as Einsteins, which is unfair. +2 marks can hence be used to permit students to pursue the college education but they can't be used to order students, in other words, to select students to Anna University or to decide the branches within Anna University. In short, +2 exams and entrance exams serve different purposes. One is for testing basic competencies, other is for selection. It's better to keep both separate. 3. Using +2 marks is more immoral than entrance exam: Access to resources is the problem with entrance examination and hence admissions based on these results is termed immoral. But, using +2 marks is more immoral because it is a lottery for all practical purposes. As noted above, if there are only 1000 seats in Anna University and the first 600 people get same marks, the allocation is done based on "birth year" and a "random number allocated to the candidate". This is essentially a lottery. A person may miss a seat in a particular branch, merely because of getting a wrong lottery number. If randomness of the place of birth is considered immoral, this random allocation is equally immoral. If anything, a hard working rural student might get treated equally with a non-hardworking urban candidate in this procedure. It levels everyone. 4. +2 exams seem equitable because of marks inflation and not due to equal access: One of the arguments is that using +2 marks is an equitable criterion because of the lower barriers to access to +2 colleges as compared to exam coaching centres. This isn't true. +2 marks seem equitable only because the exams are of poor standard and marks are inflated. The moment we try to enhance the standards of these exams and test real understanding, the same problems with entrance exams kick in. So, we shouldn't be misled by the mask of high marks scoring capability in +2 exams, for being an equitable exam. 5. +2 exams are important of rote learning: Year end exams influence the nature of teaching in class rooms. If the exams are based on questions that require rote learning, the learning in classroom is also geared towards that. If the exams ask questions involving a deep understanding of cconcepts classroom learning also strives to achieve that. In India, +2 exams are as rote as an exam can get. The questions are usually from the exercises at the end of the chapter. Students are tested repeatedly on these same questions, so that they reproduce appropriately. Using +2 exams for admission to engineering and medical entrance will increase the stakes and only promote rote learning. 1. Differentiating efforts within the group and between groups: The arguments of "higher income" and "urban" advantages are genuine but such comparison "between groups" misses a point. Many students with "urban" or "higher income" criteria write the exam. Not everyone qualifies. Attributing ranks to only these criteria fails to appreciate the "efforts factor" that differentiate between the qualifiers and non-qualifiers within the "urban", "higher income" groups. A hard working "urban" student should thus be differentiated from another "urban" student that didn't put required efforts. Similarly, a "rural" student that didn't put required efforts should be differentiated from a hard working "rural" student with a similar background. +2 exams don't do that because of their poor differentiating capability, as discussed above. With a high number of students scoring top marks, seat allocation parallels a lottery for all practical purposes. It does disservice to students, as it fails to differentiate students "within groups" (urban or rural) and places everyone on the same plane. Remember that attempts to enhance the quality of +2 exams, thereby increasing their differentiating capability, will again lead to the same concerns cited regarding entrance exams (access to quality colleges or coaching). 2. We already correct for "place of birth": All the above arguments suggest that +2 marks aren't an appropriate criterion for ordering the candidates. But, the question of privilege of birth that determines performance in entrance exams still remains. It is true that accident of birth plays a significant role. There's no denying. However, one must note that we already correct for such vagaries of birth in the form of caste-based and gender-based quotas in college admissions. We can definitely have caste and gendered based quotas, and we should have, but we will only be fooling ourselves and students if we try to address the problem by inflating the marks. Thus, overall, using +2 marks for ordering students is a very bad idea. Finally, as Akilan points out, TN stopped collecting "rural/urban" data of students. He asks "Where is the government data on admission of rural students? Are we just whipping emotions using anecdotes that fit our narrative?" Thanks to Akilan for educating me on this topic. I benefitted from discussions with him. The possibility of spending money on alcohol etc. is one of the primary arguments against cash transfers. I had earlier blogged that these fears may be exaggerated. We have RCTs from several countries showing that this isn't the case - the poor don't spend money on alcohol if they are given cash. This is counter intuitive to the experience of many who have visited Indian villages, where rampant alcoholism is a big problem. One of the reasons for the divergence from seeming reality is that spending choices depend on the labelling of money. If money is given to people, saying that it's meant for a particular purpose, they are more likely to spend only towards that activity. This is unlike salary, which comes with no strings attached, where we see the expenditure on alcohol. The other reason is that cash transferred into women's account are spent differently from those transferred to men's account. But still, people used to ask evidence from India. We now have evidence from a conditional cash transfer intervention in Bihar regarding the amount spent on food. Remember that this intervention is in Bihar, where alcoholism is a big issue. So, this is tested in one of the areas more likely to see spending on alcohol. Bihar started a conditional cash transfer intervention to address malnutrition in children. Each mother gets Rs.250/- per month till 2 years. She receives 2,000 bonus at the end of 2 years if the child is not under weight. She also has to adhere to certain conditions like regular visits to health centre etc. 1. 91% money is spent on food. Majority of the rest money is spent on health and related issues. 2. Cash given to beneficiaries was not spent on tobacco or alcohol. This is yet another piece of evidence in the emerging literature that disputes the popularly held notions about spending patterns of the poor. There might be other reasons for choosing or not choosing cash transfers over other methods but we need to certainly place less emphasis on the concerns over spending on alcohol and tobacco. PS: The intervention reduced "wasted children" by around 8%. Why do caste-religion identities still persist in India? Caste-Religion identities put group over an individual. People who argue for individual's freedom often wonder why the caste-religion identities run deep in India, even after 70 years of independence. There are no easy answers but here are some explanations. 1. The relationship between caste and democracy: Pratap Bhanu Mehta points to the paradox of social justice that deepens the identities. It's like this. Caste is the unit of social discrimination. So, the demand for equality and justice has been on the basis of “caste”, which deepens group consciousness. Thus, paradoxically, the struggle against identity entrenches these identities. 2. Politics of recognition: In multicultural societies, when certain minority groups face discrimination, they seek recognition, often in terms of politics and other avenues. Taylor calls this the "politics of recognition". The struggle for caste representation in politics is rooted in this. This entrenches group identities. 3. Nature of Hinduism: Sociologist Dipankar Gupta says that humans want to belong somewhere but Hinduism provides some sort of rootlessness. There is nothing that two Hindus can do that one cannot. This is unlike Islam and Christianity, where you have to come together. For instance, one needs congregation for actual prayers. Even in Sikhs, it’s a Sangat only when you are together. In Hinduism, the case is different. You can build own temple, have own guru, do your own prayer and so on, without the necessity of a group. That is why Hindus need to belong somewhere. This longing to belong somewhere is filled up political leaders rallying people along this unit. 4. Caste networks as a source of emergency safety net:. In India, in the absence of proper social nets, caste groups became the source of social insurance in times of emergencies. Prof. Kaivan Munshi documented this phenomenon. He also says that presence of caste security nets in villages is one of the main reasons for relatively low rural-urban migration in India. So, better not be in bad terms with the caste group. The dependence on the caste group again entrenches the group identity. 5. Politicians' actions: Politicians have deliberately deepened the fissures along these lines, for electoral purposes, creating more consciousness and rigidity of the group. The idea of citizenship is new and artificial. Its purpose is to combat these group identities. It will take longer than 70 years for citizens to shed their primordial loyalties and owe their primary allegiance to what Habermas calls “constitutional patriotism”. One immediate thing that can be done is to make politicians stop deepening fissures along identity lines. They can be rallied around important issues, not around identities. Anupam Manur and Archit Puri have an article in Mint on proposed minimum wage law. They broadly argue against the minimum wage law. They give the following arguments. All these are genuine concerns but this is a misleading picture of minimum wage literature. To start with, let’s consider the authors’ summary of Stigler's argument “minimum wage does not satisfy its original intentions — elimination of poverty — and will tend to increase unemployment and reduce family income.” This isn’t a complete summary of Stigler’s argument. While Stigler did say that minimum wage doesn’t reduce poverty and can increase unemployment, he also added that the minimum wage can increase productivity because well-paid workers are motivated to work better. This is partly because of increased motivation and partly because it is costly to lose the job now. Also, remember that this seminal work of Stigler was way back in 1946. Much has happened since then. Apart from this, there are other famous theoretical papers on minimum wages. One by Stiglitz, Kaushik Basu and Genicot, where they argue that people are financially insecure at lower income levels and hence they are willing to supply “more labour”. They argue that providing “wage floors” reduces their risk. Other papers argue that people face uncertainty risks during a job transition. Hence, it tilts the balance in favour of employers, making them pay only retention wage. Thus, increased productivity, need to address labour market frictions are two other important arguments in favour of minimum wage law. The Mint article should have ideally mentioned these too if it were an objective analysis. Let’s come from theory to empirics because minimum wage law has always been a puzzle because it defies many textbook effects. For instance, the most famous prediction is that minimum wage law increases the cost of business, forcing them to close down. But this didn’t happen in many cases. David Card’s famous 1993 paper analysed the effect of minimum wages on fast food restaurants and find no effects of unemployment. A host of other studies that followed also found similar results in minimum wage laws. Several economists had also written a letter to Obama a few years back to increase the minimum wage. Paul Krugman neatly summarised the broad trend of the findings — for the level of which the wages are currently, there is no compelling evidence to say that minimum wage laws cause unemployment. The overwhelming evidence contrary to textbook economics is because there are labour market frictions that markets don’t address. Minimum wage law corrects those. The Mint article doesn’t mention this broad trend of results from numerous studies, instead, picks a one-off study which shows the opposite result. A fair question now may be— will the minimum wage laws have a different effect in the US and in India? Again, one can always quote studies that suit one’s argument but many such studies tend to be simulations, projections, estimates and are not rigorous enough. The best evidence of minimum wage laws comes from this large RCT on NREGA by Muralidharan et al, with large sample size. Literally, the whole of erst-while united Andhra Pradesh was part of this sample. So, the results are generalizable. Also, this RCT captures the General Equilibrium effects, meaning that it captures effects such as employment in one village leading to unemployment in others, instead of focusing on only a narrow area. The key argument is that NREGA provides a “wage floor” to workers, similar to Basu, Stiglitz and Genicot’s paper discussed above. It means that NREGA provided a bargaining tool for workers. They can choose not to work for wages below NREGA, thereby pushing up their wages. This is similar to the effect of minimum wage laws. It was initially argued that such bargaining phenomenon can occur only during the NREGA season)thereby downplaying its ability to increase wages of other jobs in other seasons. On the other hand, some argued that NREGA does increase the wages of labour in other sectors but it led to closure unemployment, similar to minimum wage law effects. Muralidharan’s paper finds that NREGA resulted in the best of both worlds. It both increased the wages in other sectors, even during the non NREGA season, and also did not cause unemployment. This demonstrates the existence of labour market frictions. Shamika Ravi also admits that NREGA corrected the labour market wages, reducing the frictions and inefficiencies. This is quite contrary to the textbook economics and also against the key argument of the Mint article. This doesn’t mean that minimum wage law can never cause unemployment. The level of wage is obviously important. If the minimum wage is fixed at Rs.50,000 per month for an unskilled job, it will definitely cost distortions. But, wages are generally not at those levels to cause distortions at the commonly envisaged levels. The sector also matters. An objective analysis of minimum wage law should also outlay both the theoretical arguments in support of minimum wage law — increased productivity, higher wages, ability to correct market frictions— and also a general trend of insights from empirical studies’ that find no impact of such laws on unemployment. I find the Mint’s article misleading because it doesn’t touch these aspects. It has been my wish to see separate chapters on education and health care in the survey. They only find a brief mention, even this time. The analysis and recommendations are only cursory. Green (that can result in outcomes): Mid day meals etc. Red (need not result in outcomes): increasing teachers. We usually hear that teacher shortage is a big issue but the survey recommends not to increase it, at least puts it as the least priority. This is because of misinterpretation of ASER data. 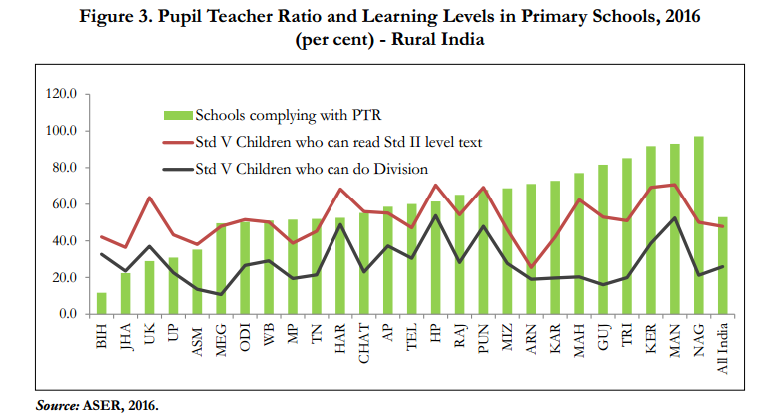 Looking at ASER and PTR data, the survey says that “States complying with PTR provision of RTE Act have lower learning outcomes” (para 10.11, p 258). Hence, it categorizes “increasing teachers” under Red Box in the recommendations. There are several issues with this inference. 1. “States complying with PTR provisions have lower outcomes” may be a misleading interpretation, as it implies causation. 2. Looking only at PTR vs. Outcomes graph [Fig 3, p 259] may not be the correct way to understand the data in this context. It’s because, on a macro level, “no single input” can alone result in outcomes. It needs a combination of several critical inputs. For instance, states with higher PTR might have other enabling factors and so on. One needs to have a lower PTR to do anything meaningful. Any good classroom pedagogy is built on this. Experimental evidence [paper, ppt] also suggests along similar lines. Lowering PTR alone results in outcomes only when the initial class sizes are high. For smaller classrooms, PTR reduction results in outcomes when one combines it with other interventions. This doesn’t mean that we should keep classrooms large. We should thus be advocating for reducing class size and complementing it with other interventions instead of recommending against lowering PTR. 3. The Survey’s section on recommendations reflects the issue with comparing Outcomes and PTR to draw insights. Remedial education is one of the recommendations. Remediation is an intensive activity requiring personalized attention, that means a lower PTR. But, the survey categorizes “increasing teachers” under “Red Box”, an inference from comparing PTR and Outcome data, resulting in a contradiction. We can’t both NOT reduce PTR (NOT increase teachers) and also do remedial education. There is another minor issue in the survey. It says “While ‘The Right of Children to Free and Compulsory Education Act’, 2009 (RTE), has significantly improved the enrollment level in primary schools across the country…..”. I am afraid, this isn’t true because we had already reached near 100% enrollment before RTE came into place. Hope the survey dedicates a separate chapter to education, going into more depth, summarizing existing research, putting it in a policy perspective. Currently, no important document does that. Swarajya Magazine has started a series on education reform. It’s a good initiative to document diverse views. However, most of the discourse is repetitive and also exhibits common pitfalls. I am listing some of them below. 1. RTE is THE education policy: Most of the education policy discourse in India has been only on RTE, in recent days. The Swarajya series also reflects the same. As I have blogged earlier, RTE is NOT THE education policy. There’s much more to education policy. Also, RTE is NOT the hurdle holding back governments from reforming. Think about it — nothing in RTE stops the governments from initiating revamp of critical areas — teacher recruitment, teacher training, infrastructure, strengthening SMCs, providing career counselling to students and so on. Reasons are something else. It’s high time we stop blaming RTE and think beyond it. We should instead focus energies on getting governments to work on these critical areas, instead of being distracted by single point agenda of RTE. 2. Learning outcomes declining due to RTE: The decline of learning outcomes since 2010 is widely quoted and is attributed to RTE. This isn’t even a problem of “mistaking correlation for causation”. People miss that learning outcomes have been on decline much before RTE, that can observed ever since ASER began in 2006, much before RTE 2010. As I blogged earlier, there is diversity in this. Not all states showed decline. Some in fact have improved. We thus need to look beyond RTE and not attribute the decline solely to it. a) Outcomes have been declining even before NDP when there was detention in place. They have been on a declining trend ever since ASER started in 2006 (RTE started in 2010). Why were outcomes declining when there was detention in place? It means that NDP is not the sole reason. b) Learning outcomes in private schools slightly increased after 2010. How does NDP explain this? c) As per DISE data, even during the pre-NDP era (2006-2010), only 5%-6% students were detained at the maximum. From ASER, we also know that learning outcomes were poor and students weren't at grade levels even during this period. If learning outcomes were poor and students were not at grade level, how is it that only 5%-6% students were detained at the maximum? This raises questions on the feasibility of its implementation. Overall, it seems that NDP is being made a scape goat for other systemic deficiencies. Excessive emphasis on NDP is shifting our attention away from the other real and important constraints. Doing away with NDP may in fact make us complacent, thinking that we have addressed a major issue, which in fact might not be an issue at all! 4. Misunderstanding of inputs-outcomes evidence: The words “inputs don’t result in outcomes” are being thrown around loosely. The inference being that any initiative on inputs front won’t yield outcomes and hence shouldn’t be taken up or given less priority. This is a complete misreading of evidence. If you do a controlled study of each of the inputs individually, none of them will likely show results. It doesn’t mean that these aren’t essential inputs. It only means that working only on these specific individual inputs may not yield outcomes. There could be many reasons for this, one of which is lack of complementary inputs. This calls for initiating reforms across wide spectrum to make these effective. It doesn’t mean we abandon them. Outcomes are necessary but outcomes don’t arise from vacuum. They arise from inputs. These are called inputs for a reason. Inputs are like bare shoes. Laces are the “capacity” that holds these shoes firm, translating it into good experience. We now lack these laces. Abandoning shoes is not the solution for lack of laces. 5. No need of money or excess money is being spent: As with the case of inputs, only money may not yield outcomes. But it doesn’t mean that money isn’t needed. It is a fact that education system has deficiencies in many critical inputs. Even if one focuses on outcomes, very soon one would realise that it needs addressing challenges in many critical inputs, all of which need money. The other strand of criticism is that the per-child spending in public schools is high. This is another misplaced criticism. Governments are obligated to provide education irrespective of financial feasibility of setting up schools in remote areas, even if it means few students. It naturally drives up the per-child costs. This isn’t a metric that the governments shouldn’t be judged up on. 6. “Focus on outcomes”: "Focus on outcomes and inputs" is another loosely used term. One should be clear on what focusing on outcomes means. If not, it may lead us into same old strategies that led us into this situation. For instance, "focus on outcomes" is taken to be equivalent to focusing only on pedagogy since that’s the one that directly leads to outcomes. This is leading to same old mistake of picking up a complex pedagogy and laying it over a weak system, which will eventually not yield results. Further, initiatives on anything other than the pedagogy, on the input front are blamed for not focusing on outcomes. We need to be thus careful about the meaning of "focus on outcomes". The traditional approach of reform has been a "sequential approach", where schools are built first, then efforts are made on ensuring student attendance, then textbooks and once all these are resolved, come to the outcomes. When we say "focus on outcomes", what we mean is to reverse this pyramid. Focus on outcomes, and in the process, if you feel the necessity for any input, provide it. In this approach, inputs aren't the end, they are only the means. It's not sequential, it's simultaneous where initiatives are taken across the spectrum simultaneously. This approach also means that one shouldn't completely write off initiatives that focus on inputs, instead one should attempt to create value for the inputs. 7. Language of accountability: “There is lack of accountability” are other loosely used terms in education policy discourse. The language of traditional accountability is for usual situations where outcomes can be measured, in short term, and can be attributed to specific person. All of these don’t hold true in case of education where the mechanisms are fuzzy and often factors are beyond the purview of teachers. In fact, as several studies show, there is too much of accountability in system, but on wrong metrics. For instance, teachers are always in a rush to complete syllabus, a metric on which they are made accountable. Similarly, the academic mentors are made accountable for data collection. This form of traditional accountability has reduced the personnel in education bureaucracy into what Yamini Aiyar calls “post-office state” where personnel feel that they are mere cogs in the wheel and are only meant to follow instructions. This "let me catch and punish" form of governance, aiming to make people adhere to rigid rules and mechanisms is disastrous in sectors like education where the personnel are supposed to use discretion and empathy. As Akshay Mangla's study shows, places with a healthy dose of discretion perform better than those with rigid bureaucratic structures. The language of "traditional accountability" of "let me catch and punish" paradigm based on inherent suspicion prevents fostering of such practices and hence is antithetical to governance in education. We thus need to move away from the traditional language of accountability to more dynamic forms suitable to education. 8. Public schools haven’t worked till now - Private schools are better than public schools: It is often said that public systems haven’t worked till now and hence it’s time to look beyond them. The problem with this inference is — i) nothing worked till now. Neither public schools nor private schools; ii) enough attention has never been paid to public systems till now. We are only doing this slowly, only time. Thus, trying to dismiss something without even trying to do something about it doesn’t make sense. Similarly, it is widely believed that low-cost private schools are better than government schools. A wide range of evidence now shows that this isn't necessarily true. The difference in outcomes is driven by the type of people who attend these schools and it has nothing to do with the teaching or value addition of low-cost private schools. 9. "X is the major problem": There is a tendency in policy to advocate their own “pet reform” (X)., which often takes the narrative of "X is the major constraint, we need to address it." For instance, either a recommendation to address political participation of teachers or teacher training etc. Lant Pritchett calls his as "Selling Solutions vs. Selling Problems". It means that you want to suggest teacher training as the solution and hence you being by saying that saying that teacher training is the constraint. There's also what I call "expertise bias" driving the piecemeal recommendations. People tend to give recommendations only on aspects of education that one's expert in. The problem with such diagnosis and recommendations is that such they narrow your vision to only few aspects, neglecting other crucial elements of reform. Once you narrow down teacher as the main problem, you are blinkering yourself to other important aspects like community engagement, career counselling etc. Often, these "X"s are only symptoms of an underlying problem. For instance, there may be issues with pedagogy. But the more important question is - what is it that made us take so long to recognize this? What is it that's making systems not to address this? Probing in this manner enlarges one's vision. In other words, "X" may be a problem, but so are "A", "B", "C" and so on. We need to work on all. Thus, what we need is NOT a laundry list of X, Y, Z that blinkers our view and narrows our vision; what we rather need is a strategy that enables us to identify all these and work on all of them simultaneously. 10. Per-student funding and linking outcomes to teacher’s salary: We need to exercise caution over some of these seemingly good ideas. They are incredibly complex and tough to get, especially in context of weak state capacity like India. There’s a reason why they haven’t worked else where in the world. For a detailed diagnosis of Indian public education system and strategy for reform, read my book “UnpackED — The black box of Indian school education reform” (pdf is free to download). My book seeks to answer two fundamental questions - Why don't government's efforts lead to outcomes? and Why do governments do what they do? Refer the following four posts for the summary of the main arguments of the book. 1. [UnpackED - 1] Why do governments' efforts to reform education not yield outcomes? 2. [UnpackED - 2] Why do governments' do what they do? 3. [UnpackED - 3] Why are the best Indian private schools only below average on a global scale? The strategy for Indian public education reform should incorporate the three lessons from previous attempts to reform. 1. No piecemeal reforms. Pursue reforms across wide range. 2. Don't prematurely overload the system. Start simple as per capacity of system. 3. Don't rely excessively on figuring out workarounds. 5. Don't follow post-office style functioning. Shape norms of education bureaucracy making them conducive to deliver education. The first step is initiate reforms across wide range. How do we then now the sectors where reforms are to be initiated? We can surely list some of them but listing all may not be possible. Hence, one should use a probe to identify the constraints. This probe should be an intervention aiming at outcomes. On implementing it, we come across the constraints involved in making the system work towards achieving outcomes. We learnt in second lesson that we shouldn't prematurely overload the system. Hence, this probe should work even in contexts with weak capacity. Pratham's TaRL model suits the specifications of the probe. It's so simple that even 10th grade pass volunteers could use it. Further, it's effectiveness in promoting outcomes is tested and proven by numerous RCTs, satisfying our "outcome" criteria. The third, fourth and fifth lessons should be kept in mind while implementing this intervention. During the process of implementation, if one realises that textbook delivery is being delayed, one should fix the issues causing delay, instead of resorting to temporary workarounds. If one realises that teachers are not taking this seriously because they are another original mandate of completing the syllabus, such requirement can be done away with. The nature of functioning of academic support personnel can be shaped using this. If one realises that lack of good role models is the issue, this can be worked out by providing exposure to children. If parent's engagement is weak, efforts can be made to improve the functioning of SMCs and so on. It should be noted that most of these responsibilities should be devolved to local levels. Ideally, nothing above district level should be involved in this except for overseeing. This has to be coupled with human management strategies. For instance, it's difficult to motivate teachers if they are facing any pressing issues. To bring people on board, one can first talk to teachers, address their problems and thus build a relationship of reciprocity. Finally, it's important to note that this form of reform is only temporary. It's only till the clogs are cleared in the system, basic things are in place and till the system reaches acceptable levels of capacity. Once that's done, local institutions can be given freedom to pursue their own way. By this time, we would have enhanced the adaptive capacity of the systems. So, the progress goes on. The advantage of pursuing reform in this manner is that it doesn't leave out any input required for ensuring outcomes. Focusing on the outcome surfaces the constraints and capacity building approach helps people to resolve it in appropriate manner. Further, this approach disentangles the phrase "focus on outcomes". This phrase has become common parlance these days but it is also being misinterpreted. Some interpret as a recommendation to not focus on any other input to education process. Governments' efforts in infrastructure, motivation building etc. are considered as distraction. The "focus on outcomes" approach interestingly is leading to same age old practices of quest for right pedagogical models and scaling them up. It's because pedagogy is proximate factor in causal link ensuring outcomes. The approach discussed helps us to overcome these traps. Contrast this with the policy recommendations provided in form of laundry list of tasks to be done. It leaves out many inputs required to ensure outcomes. The diversity of contexts mean that some of these may not be applicable to all cases. Further, resolving individual constraints in silos doesn't channelise the gains into outcomes but focusing on outcomes and resolving constraints faced does. One can observe that this form of reform doesn't involve specific actionable policy recommendations. It's because the nature of education is such. Recommending bullet points is easy but is misleading. It necessarily needn't lead to outcomes. For a long-lasting reform, one has to essentially pursue own path, continuously adapting in the process, with focus on outcomes. Having said this, one should also specify four important points. One, political will is needed for the reform. Initiating reforms across a wide range of domains isn't an easy task. It can't be driven by top bureaucrat's initiative alone. It's necessary to overcome the political opposition if any. Also, it's required to send a strong message across the bureaucracy to motivate them. Two, progress fast. The slower one moves, the more complicated things seem. If one's moving fast, then minor deficiencies don't seem prominent. Else, every minor issue gets magnified, seems prominent. The need for most controlled studies aiming to explore individual constraints arose out of slow progress of reform. If reform was fast, questions like should we have toilets or textbooks wouldn't have been a matter of discussion. Three, basic law and order should be in place. Law and order is a pre requisite for functioning of a civilised society. A poor law and order situation hampers education in numerous ways. It decreases the general seriousness of people towards their duties. It hampers transport of children and so on. Most importantly, a district administration busy with firefighting law and order won't have bandwidth to lead a protracted reform. Four, this form of reform may not be applicable to tribal areas or violence affected areas. In such cases, bringing all students together to a central place and delivering education through a residential school is the best way forward. Dantewada administration has done excellent work on these lines. It can serve as a basic template and inspiration. As a citizen, how to know if a government is pursuing right education reform? 1. Outcome focused: Governments pursuing right reform will have outcome focused. You can check this in the way they phrase their aims. If their primary initiatives have goals like reducing dropout etc, then they are not pursuing the right path. You should feel that all the initiatives of government are channelising towards outcomes. If government lists distribution of tablets and computers to schools, construction of xyz schools as their top schemes, without any mention of outcomes, it means that there is no plan to channelise efforts towards outcomes. 2. Reform across a wide range of domains: Governments serious about reforming education will initiate efforts across a wide range of domains. They won't pursue the path of one constraint at a time. 3. Decentralisation: Serious reform involves elements of decentralisation. Without this, a large scale reform of the nature required in education isn't possible. 4. Strong communication highlighting the importance of education and motivating bureaucracy: A serious reform isn't possible with strong communication highlighting the purpose and motivating the employees. You find important political leaders constantly engaging with teacher community, addressing their problems and motivating them. A strong communication is also important to create a perception of good aura about government schools to break some of the notions about government schools. It also signals the improvement in government schools making people hopeful. Essentially, parents should feel hopeful about sending their kids to government schools. 5. Education reflected in budget priorities: Mere increase in funding may not lead to outcomes. But, money is crucial if one is going for a reform across wide sectors. Allocating significant share of budget for education requires placing education over other priorities of government. It's a signal of the seriousness and intent of the government. So, is your government pursuing a serious reform? Which state government in India do you think is close to doing the right form of reform?